Thanks it help a little, but i still need a .dat or a .xml to read in my clrmamepro, because it help a lot more my organized set. Please if you can, or ask mame devs to change is database in the next version. As we know mame today is open source now. Merci. Hey Spindizzi: I’ve fixed some things and will send you an email within the next 24 hours. How do you figure this stuff out dude??? Open up Games.xml -- it should be pretty self-descriptive. You'll notice different ROM sections. Typically, different revisions of a game will share the same MPEG ROMs, so if they're missing, you just need to add the appropriate lines of XML to the game definition. Ah, more straightforward than I thought then - I thought this involved some kind of painstaking detective work by Spindizzi figuring out which bits of which ROM you needed to swap out between the games to get one of the other versions working. if i correctly understood what you meant,i can either use the epr-19338a.bin file from scud or the epr-18261.ic9 from sega touring..right ? 'epr-21065a.20' (CRC32 0x3223db1a) not found in 'lemans24.zip' for game 'dirtdvls'. 'mpr-21041.33' (CRC32 0x8f1ac988) not found in 'lemans24.zip' for game 'dirtdvls'. 'mpr-21028.6' (CRC32 0xdb11f50a) not found in 'lemans24.zip' for game 'dirtdvls'. 'mpr-21027.5' (CRC32 0x74e1496a) not found in 'lemans24.zip' for game 'dirtdvls'. 'mpr-21026.4' (CRC32 0xf4937e3f) not found in 'lemans24.zip' for game 'dirtdvls'. 'mpr-21043.35' (CRC32 0x707015c8) not found in 'lemans24.zip' for game 'dirtdvls'. 'mpr-21042.34' (CRC32 0x1dab621d) not found in 'lemans24.zip' for game 'dirtdvls'. 'mpr-21035.27' (CRC32 0x618b7d6a) not found in 'lemans24.zip' for game 'dirtdvls'. 'mpr-21036.28' (CRC32 0x0e665bb2) not found in 'lemans24.zip' for game 'dirtdvls'. 'mpr-21029.7' (CRC32 0x89867d8a) not found in 'lemans24.zip' for game 'dirtdvls'. 'mpr-21030.8' (CRC32 0xf8e51bec) not found in 'lemans24.zip' for game 'dirtdvls'. 'mpr-21024.2' (CRC32 0xede859b0) not found in 'lemans24.zip' for game 'dirtdvls'. 'mpr-21023.1' (CRC32 0x932a3724) not found in 'lemans24.zip' for game 'dirtdvls'. 'epr-21062a.17' (CRC32 0x64b55254) not found in 'lemans24.zip' for game 'dirtdvls'. 'mpr-21040.32' (CRC32 0xb550c229) not found in 'lemans24.zip' for game 'dirtdvls'. 'mpr-21039.31' (CRC32 0x61407b07) not found in 'lemans24.zip' for game 'dirtdvls'. 'mpr-21038.30' (CRC32 0x9b59d2c2) not found in 'lemans24.zip' for game 'dirtdvls'. 'epr-21064a.19' (CRC32 0x2a01f9ad) not found in 'lemans24.zip' for game 'dirtdvls'. 'epr-21063a.18' (CRC32 0x6ab7eb32) not found in 'lemans24.zip' for game 'dirtdvls'. 'mpr-21037.29' (CRC32 0x90b98493) not found in 'lemans24.zip' for game 'dirtdvls'. 'mpr-21034.26' (CRC32 0xacba5ca6) not found in 'lemans24.zip' for game 'dirtdvls'. 'mpr-21025.3' (CRC32 0x6591c66e) not found in 'lemans24.zip' for game 'dirtdvls'. 'mpr-21044.36' (CRC32 0x776f9580) not found in 'lemans24.zip' for game 'dirtdvls'. 'mpr-21045.37' (CRC32 0xa28ad02f) not found in 'lemans24.zip' for game 'dirtdvls'. 'mpr-21046.38' (CRC32 0x05c995ae) not found in 'lemans24.zip' for game 'dirtdvls'. 'mpr-21047.39' (CRC32 0x06b7826f) not found in 'lemans24.zip' for game 'dirtdvls'. 'mpr-21048.40' (CRC32 0x96849974) not found in 'lemans24.zip' for game 'dirtdvls'. 'mpr-21049.41' (CRC32 0x91e8161a) not found in 'lemans24.zip' for game 'dirtdvls'. 'epr-21066.21' (CRC32 0xf7ed2582) not found in 'lemans24.zip' for game 'dirtdvls'. 'mpr-21031.22' (CRC32 0x32f6b23a) not found in 'lemans24.zip' for game 'dirtdvls'. 'mpr-21033.24' (CRC32 0x253d3c70) not found in 'lemans24.zip' for game 'dirtdvls'. 'mpr-21032.23' (CRC32 0x3d3ff407) not found in 'lemans24.zip' for game 'dirtdvls'. Ignoring game 'dirtdvls' in 'lemans24.zip' because it is missing files. 'mpr-22877.8' (CRC32 0xe53b8764) not found in 'lemans24.zip' for game 'eca'. 'mpr-22874.5' (CRC32 0x5e990497) not found in 'lemans24.zip' for game 'eca'. 'mpr-22857.29' (CRC32 0x44e6ce2b) not found in 'lemans24.zip' for game 'eca'. 'mpr-22884.15' (CRC32 0x254c3b63) not found in 'lemans24.zip' for game 'eca'. 'mpr-22883.14' (CRC32 0x86d90148) not found in 'lemans24.zip' for game 'eca'. 'mpr-22854.26' (CRC32 0x97a23d16) not found in 'lemans24.zip' for game 'eca'. 'epr-22903.17' (CRC32 0x53882217) not found in 'lemans24.zip' for game 'eca'. 'mpr-22858.30' (CRC32 0x0af40aae) not found in 'lemans24.zip' for game 'eca'. 'mpr-22873.4' (CRC32 0xdd406330) not found in 'lemans24.zip' for game 'eca'. 'mpr-22870.1' (CRC32 0x52054043) not found in 'lemans24.zip' for game 'eca'. 'mpr-22875.6' (CRC32 0x1bb5c018) not found in 'lemans24.zip' for game 'eca'. 'mpr-22856.28' (CRC32 0x9c0d1d1b) not found in 'lemans24.zip' for game 'eca'. 'mpr-22871.2' (CRC32 0xcf5bb5b5) not found in 'lemans24.zip' for game 'eca'. 'mpr-22876.7' (CRC32 0xa7561249) not found in 'lemans24.zip' for game 'eca'. 'mpr-22859.31' (CRC32 0xc64f0158) not found in 'lemans24.zip' for game 'eca'. 'epr-22906.20' (CRC32 0x7f6426fc) not found in 'lemans24.zip' for game 'eca'. 'mpr-22855.27' (CRC32 0x7249cdc9) not found in 'lemans24.zip' for game 'eca'. 'epr-22905.19' (CRC32 0x9755dd8c) not found in 'lemans24.zip' for game 'eca'. 'epr-22904.18' (CRC32 0x0ff828a8) not found in 'lemans24.zip' for game 'eca'. 'mpr-22882.13' (CRC32 0xb161416f) not found in 'lemans24.zip' for game 'eca'. 'mpr-22885.16' (CRC32 0x3525b46d) not found in 'lemans24.zip' for game 'eca'. 'mpr-22872.3' (CRC32 0x4fde63a1) not found in 'lemans24.zip' for game 'eca'. 'mpr-22860.32' (CRC32 0x053af14b) not found in 'lemans24.zip' for game 'eca'. 'mpr-22861.33' (CRC32 0xd26343da) not found in 'lemans24.zip' for game 'eca'. 'mpr-22862.34' (CRC32 0x38347c14) not found in 'lemans24.zip' for game 'eca'. 'mpr-22863.35' (CRC32 0x28b558e6) not found in 'lemans24.zip' for game 'eca'. 'mpr-22864.36' (CRC32 0x31ed02f6) not found in 'lemans24.zip' for game 'eca'. 'mpr-22865.37' (CRC32 0x3e3a211a) not found in 'lemans24.zip' for game 'eca'. 'mpr-22866.38' (CRC32 0xa863a3c8) not found in 'lemans24.zip' for game 'eca'. 'mpr-22867.39' (CRC32 0x1ce6c7b2) not found in 'lemans24.zip' for game 'eca'. 'mpr-22868.40' (CRC32 0x2db40cf8) not found in 'lemans24.zip' for game 'eca'. 'mpr-22869.41' (CRC32 0xc6d62634) not found in 'lemans24.zip' for game 'eca'. 'epr-22886.21' (CRC32 0x374ec1c6) not found in 'lemans24.zip' for game 'eca'. 'mpr-22887.22' (CRC32 0x7d04a867) not found in 'lemans24.zip' for game 'eca'. 'mpr-22889.24' (CRC32 0x4f9ba45d) not found in 'lemans24.zip' for game 'eca'. 'mpr-22888.23' (CRC32 0x018fcf22) not found in 'lemans24.zip' for game 'eca'. 'mpr-22890.25' (CRC32 0xb638bd7c) not found in 'lemans24.zip' for game 'eca'. Ignoring game 'eca' in 'lemans24.zip' because it is missing files. 'epr-18261.bin' (CRC32 0x0c7fac58) not found in 'lemans24.zip' for game 'lemans24'. Ignoring game 'lemans24' in 'lemans24.zip' because it is missing files. 'epr-19734.20' (CRC32 0xbe897336) not found in 'lemans24.zip' for game 'scud'. 'mpr-19675.29' (CRC32 0xff113396) not found in 'lemans24.zip' for game 'scud'. 'mpr-19663.06' (CRC32 0xf6af1ca4) not found in 'lemans24.zip' for game 'scud'. 'mpr-19662.05' (CRC32 0x3c700eff) not found in 'lemans24.zip' for game 'scud'. 'mpr-19661.04' (CRC32 0x8e3fd241) not found in 'lemans24.zip' for game 'scud'. 'mpr-19676.30' (CRC32 0xfd852ead) not found in 'lemans24.zip' for game 'scud'. 'mpr-19677.31' (CRC32 0xc6ac0347) not found in 'lemans24.zip' for game 'scud'. 'mpr-19668.11' (CRC32 0x0b4dd8d5) not found in 'lemans24.zip' for game 'scud'. 'mpr-19667.10' (CRC32 0xa8676799) not found in 'lemans24.zip' for game 'scud'. 'mpr-19664.07' (CRC32 0xb9d11294) not found in 'lemans24.zip' for game 'scud'. 'mpr-19665.08' (CRC32 0xf97c78f9) not found in 'lemans24.zip' for game 'scud'. 'mpr-19659.02' (CRC32 0xc47e7002) not found in 'lemans24.zip' for game 'scud'. 'mpr-19658.01' (CRC32 0xd523235c) not found in 'lemans24.zip' for game 'scud'. 'epr-19731.17' (CRC32 0x3ee6447e) not found in 'lemans24.zip' for game 'scud'. 'mpr-19674.28' (CRC32 0xc7b0f98c) not found in 'lemans24.zip' for game 'scud'. 'mpr-19672.26' (CRC32 0x588c29fd) not found in 'lemans24.zip' for game 'scud'. 'mpr-19673.27' (CRC32 0x156abaa9) not found in 'lemans24.zip' for game 'scud'. 'epr-19733.19' (CRC32 0x6565e29a) not found in 'lemans24.zip' for game 'scud'. 'epr-19732.18' (CRC32 0x23e864bb) not found in 'lemans24.zip' for game 'scud'. 'mpr-19666.09' (CRC32 0xb53dc97f) not found in 'lemans24.zip' for game 'scud'. 'mpr-19669.12' (CRC32 0xcdc43c61) not found in 'lemans24.zip' for game 'scud'. 'mpr-19660.03' (CRC32 0xd999c935) not found in 'lemans24.zip' for game 'scud'. 'mpr-19678.32' (CRC32 0xb8819cfe) not found in 'lemans24.zip' for game 'scud'. 'mpr-19679.33' (CRC32 0xe126c3e3) not found in 'lemans24.zip' for game 'scud'. 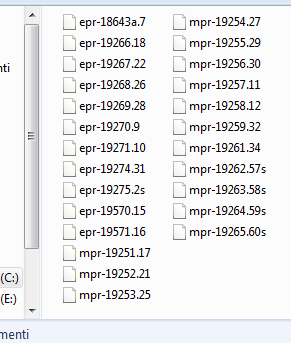 'mpr-19680.34' (CRC32 0x00ea5cef) not found in 'lemans24.zip' for game 'scud'. 'mpr-19681.35' (CRC32 0xc949325f) not found in 'lemans24.zip' for game 'scud'. 'mpr-19682.36' (CRC32 0xce5ca065) not found in 'lemans24.zip' for game 'scud'. 'mpr-19683.37' (CRC32 0xe5856419) not found in 'lemans24.zip' for game 'scud'. 'mpr-19684.38' (CRC32 0x56f6ec97) not found in 'lemans24.zip' for game 'scud'. 'mpr-19685.39' (CRC32 0x42b49304) not found in 'lemans24.zip' for game 'scud'. 'mpr-19686.40' (CRC32 0x84eed592) not found in 'lemans24.zip' for game 'scud'. 'mpr-19687.41' (CRC32 0x776ce694) not found in 'lemans24.zip' for game 'scud'. 'epr-19692.21' (CRC32 0xa94f5521) not found in 'lemans24.zip' for game 'scud'. 'mpr-19670.22' (CRC32 0xbd31cc06) not found in 'lemans24.zip' for game 'scud'. 'mpr-19671.24' (CRC32 0x8e8526ab) not found in 'lemans24.zip' for game 'scud'. 'epr-19612.2' (CRC32 0x13978fd4) not found in 'lemans24.zip' for game 'scud'. 'mpr-19603.57' (CRC32 0xb1b1765f) not found in 'lemans24.zip' for game 'scud'. 'mpr-19604.58' (CRC32 0x6ac85b49) not found in 'lemans24.zip' for game 'scud'. 'mpr-19605.59' (CRC32 0xbec891eb) not found in 'lemans24.zip' for game 'scud'. 'mpr-19606.60' (CRC32 0xadad46b2) not found in 'lemans24.zip' for game 'scud'. Ignoring game 'scud' in 'lemans24.zip' because it is missing files. Multiple games found in 'lemans24.zip' (dirtdvlsa, dirtdvlsg, dirtdvlsj, ecaj, ecap, ecau). Loading 'dirtdvlsa'. No complete Model 3 games found in 'lemans24.zip'. Last edited by doteater on Tue Mar 19, 2019 3:02 am, edited 1 time in total.